Sunflower oil is a vegetable oil, which is obtained by pressing seeds of oily varieties. 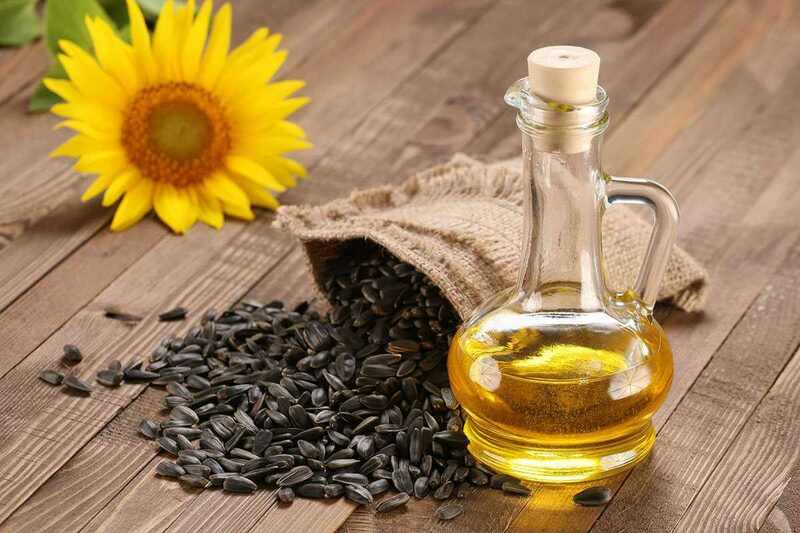 In modern home owners, sunflower oil is very popular, and it is not surprising, because it is based on the preparation of dressings for salads, side dishes, meat, fish, poultry. It is tasty, healthy and perfectly combined with various products. Buy high-quality sunflower oil at low prices you can on our website with delivery to Ukraine. • Vitamins A, E, D, which have a beneficial effect on eyesight, skin, hair, bone and immune systems, protecting a person from cancer and inhibiting the aging process. • Vegetable fats that are digested and digested better than animals. • Fatty acids are necessary for the normal functioning of the circulatory and nervous system. Sunflower oil contains vitamin E 12 times more than in the famous olive oil! The quantity is limited for one reason - the product is very high in calories. 100 g contain 900 kcal. Another reason for using a product of vegetable origin - in the composition there is no cholesterol. This harmful substance settles on the vessels, clogs them and leads to the development of a heart attack, stroke, dementia. The plant product is recommended for people suffering from atherosclerosis and cardiovascular diseases. "Agrozernoholding" offers to buy sunflower seed oil frozen out of cheese wholesale from the manufacturer. Warted and freeze-dried oil is produced by cold pressing. Sunflower seeds are cleaned, crushed, pressed with special equipment and filtered. The yield of the product is about 30%. This oil has a characteristic, pronounced taste, yellow color and short shelf life. GOST allows the presence of sediment and turbidity of the liquid. The technology of production allows you to save all the useful properties of the product. Frozen oil is exposed to low temperatures to remove wax-containing substances that form a precipitate. This product is stored longer, but has a less abundant composition. The cost of the product depends on the manufacturer and quality. Agrozernoholding offers to quickly select and order vegetable oils from leading manufacturers that are inexpensive. Sunflower oil is packaged in plastic bottles of various sizes. Spilling the product produces automatic lines, which ensures cleanliness and high quality. The packaging is environmentally safe, light and durable. The product is hermetically sealed. The label contains all information about the manufacturer, composition and shelf life. Store a bottle of sunflower oil better in a dark, cool place. The catalog contains a large number of products from different manufacturers at inexpensive prices. The price of sunflower oil of the free-flowing raw material depends on the amount of required products. You can find out how much the lot you need and buy sunflower oil with delivery in Ukraine.